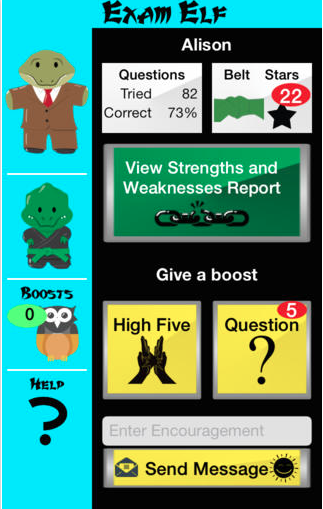 Exam Elf is a great new free iOS app that blends Game Based Learning w/ Math to make a fun learning experience for kids. This is all done in a fun interactive environment designed for grades 4th-6th and helps them develop their test taking skills.. Students try to answer questions and unlock different skills/features to help them progress in the game. Best of all are the features that are available to parents and teachers. Through something called "boosters" a educator/parent can sync up their copy of Exam Elf to their students/child's and then receive detailed real-time reporting. Also, they can send a virtual "high-five" and even help answer a question. This is a fantastic app for helping teach Math and develop basic test taking skills as well as provide high-replay value for students. I highly recommend checking out Exam Elf by clicking here!!! To find Exam Elf on Edshelf click here.